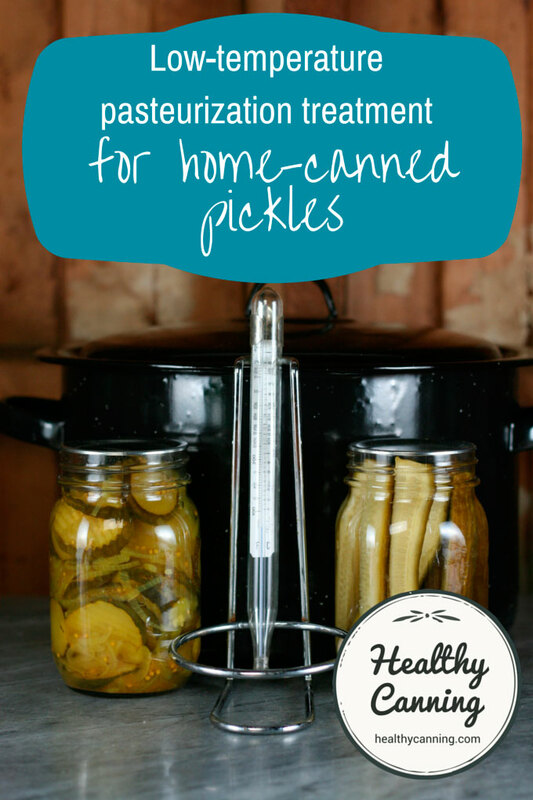 The “Low-Temperature Pasteurization Treatment” is a low and slow method for processing home canned jars of pickles. 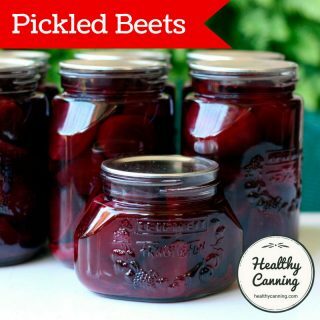 Many people hesitate to subject their pickles to a lot of heat for fear it will ruin the texture of the pickled foods. 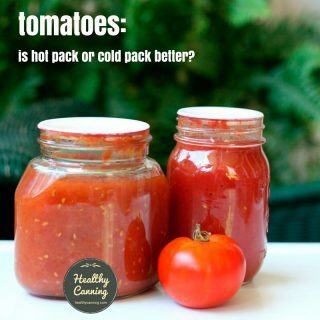 A boiling water bath can definitely soften cucumbers and some other vegetables. For this reason a scientist at the University of California developed the low-temperature pasteurization method for home picklers. 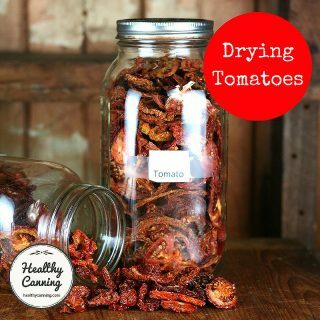 By this method you don’t boil your jars, you just immerse them in 180 to 185 F (82 to 85 C) water for 30 minutes.” Ziedrich, Linda. The Joy of Pickling. Boston, Massachusetts: The Harvard Common Press. 2009. Page 21. There’s a catch though: this process cannot be used for everything. 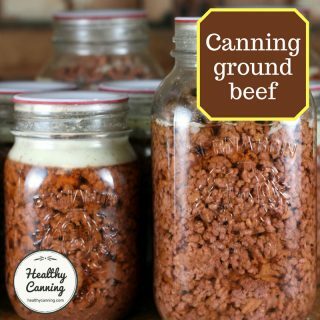 You only use with the approved recipes that say they are made to use this process. Ziedrich says that goes for her recipes, too: “[My] recipe instructions indicate when this method can be used.” Ziedrich. Page 21. Oregon State University Service cautions that the low temperature pasteurization method should not be used with reduced-sodium pickles. Perhaps the wording is poor, but it almost would appear to open the door to any cucumber pickle recipe for the low-temperature process. 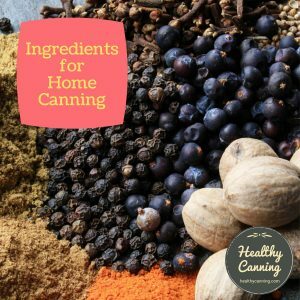 One would need to ask them via the NCHFP for clarification but in the meantime, there’s lots of other caution about using it only with recipes that call for it. They do not say why. When using the low-temperature pasteurization method, no altitude adjustment is needed, either in terms of time or temperature. The reason is that you are controlling and monitoring the temperature of the water with the aid of a thermometer, so you are going to reach and hold it between the target range at whatever altitude you are at. Do not change the processing time.”  Francis, Sarah. 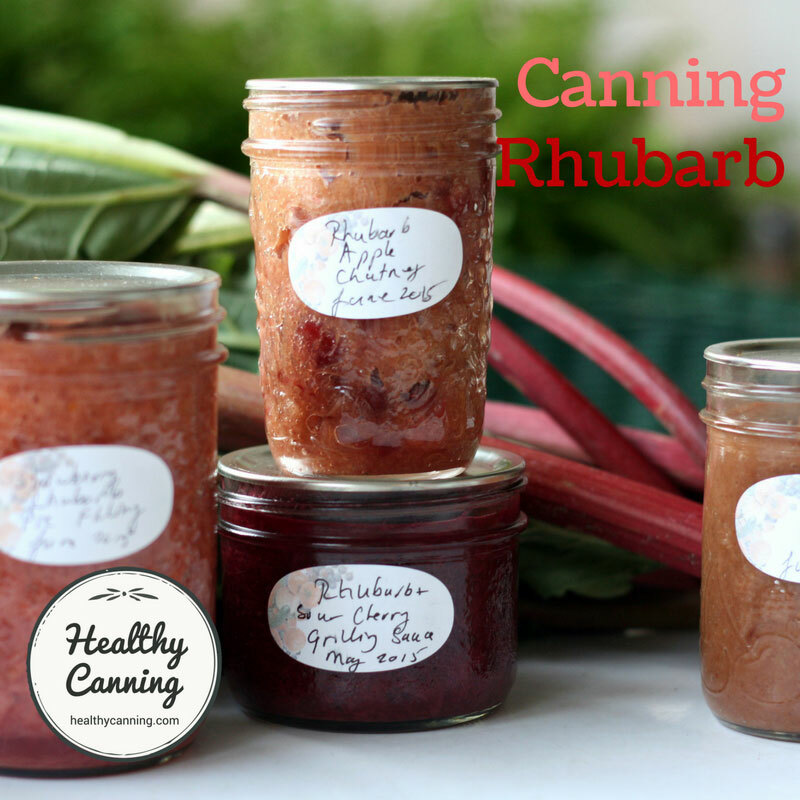 Canning: Pickles. Iowa State University Extension. PM 1368. September 2014. Page 3. 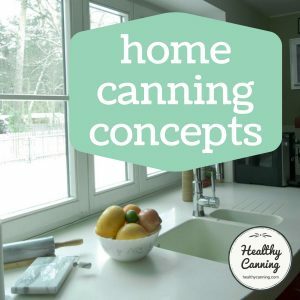 Some home canners say that the low temperature pasteurization method is particularly important for those who live at high altitudes. They say that a 10 minute boiling water bath at sea level can end up being 25 minutes for people at high altitudes, after adjustments, and few if any pickles will survive being boiled that long. 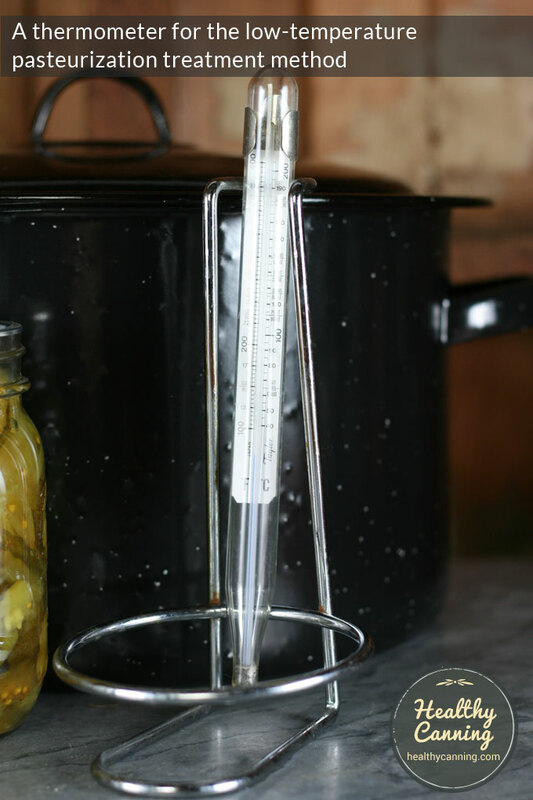 The low temperature pasteurization method might be where an electric water bath canner (such as those made by Ball, Weck or Fowlers Vacola) with a thermostat would come in handy, so you don’t have to stand by the stove for 30 minutes and watch a thermometer like a hawk. 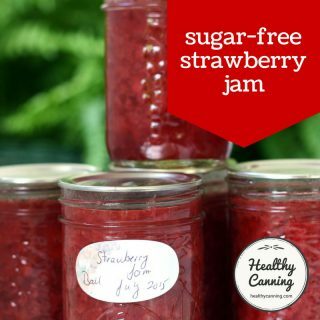 At the end of the 30 minutes, you immediately remove the jars from the canner — you don’t give them the traditional 5 minute rest period in the canner. 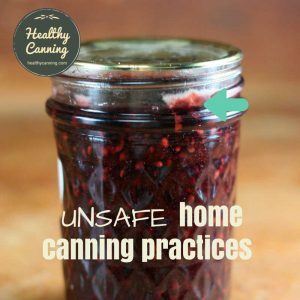 “Immediately remove jars from the canner at the end of processing time. 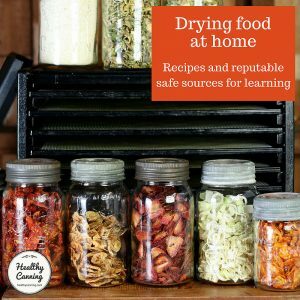 Put jars on a rack or cloth so air can move freely around them.”  Pickling Vegetables. Pacific Northwest Extension. PNW 355. June 2008. Page 5. 1. ↑ Ziedrich, Linda. The Joy of Pickling. Boston, Massachusetts: The Harvard Common Press. 2009. Page 21. 5. ↑ Ziedrich. Page 21. 8. ↑ Francis, Sarah. 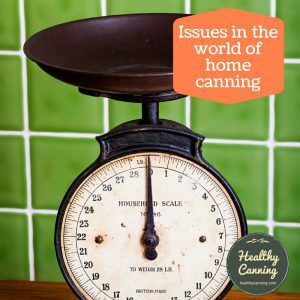 Canning: Pickles. Iowa State University Extension. PM 1368. September 2014. Page 3. 10. ↑ Pickling Vegetables. Pacific Northwest Extension. PNW 355. June 2008. Page 5. 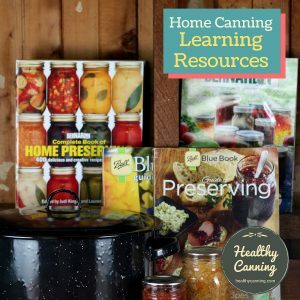 What about using a Sous Vide for low-temperature canning? 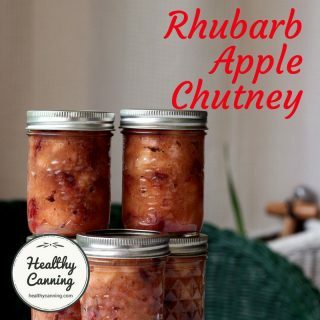 In particular, I’m interested in canning Apple Pie Filling. Can you advise? But, you don’t need the expense of a Sous Vide set up to can apple pie filling. 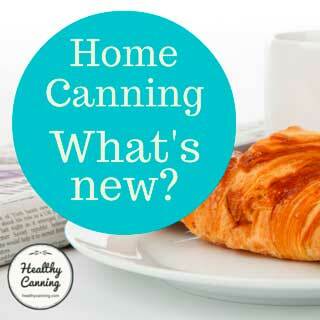 A good old-fashioned, inexpensive boiling water canner will do the trick — or, you can freeze!